Regarding arthropods, more is probably known about Drosophila than any other (Lawrence 1992). Cell walls form around the nuclei in the syncytium to form a hollow structure along which there quickly appears a series of segmental structures that differentiate along the AP axis as the embryo grows. Local organ primorida called imaginal disks develop at specific locations along the axis. The imaginal disks themselves serve as organizers for cellular subsets that are precursors of the various parts of the antenna, mouth and tailparts, legs, wings, sensory bristles, respiratory spiracles, and the like. At appropriate times, ingrowth or outgrowth starts the process of organogenesis from the imaginal disks, and these structures themselves develop AP and DV axes, and then develop PD axes as they grow in relation to the body of the embryo. 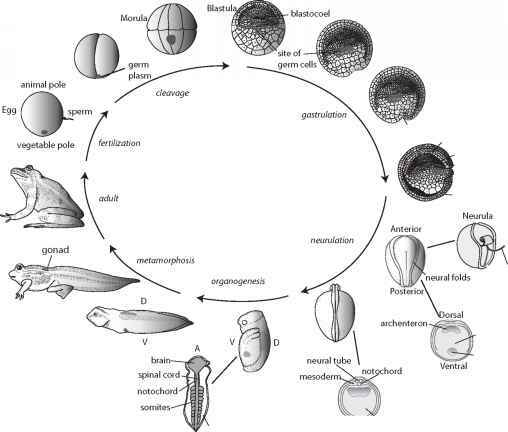 In vertebrates, developmental processes are more complicated, although the basic principles are similar (Gilbert 2003). Figure 8-5 shows one pattern, as seen in Xenopus, the laboratory frog. The basic cell types (e.g., gut, muscle, photoreceptor, neural) are similar to those in invertebrates like Drosophila, but vertebrates have to deal with some other complications. They are large, which is made possible by having an internal rather than external supporting skeleton (though in their early evolution they were covered, protected, and supported by an external scale-like skeleton), they have more complex organ systems, and they tend to live longer and have more renewable tissues (especially organs lined by epithelia, tissues with ever-dividing stem cells that renew locally differentiated special cells like those of the gut and skin), and they have more elaborate immune systems. Large internalized bodies entail thermal, mechanical, and respiratory demands and the circulatory and neural apparatus that goes with them. Figure 8-4. 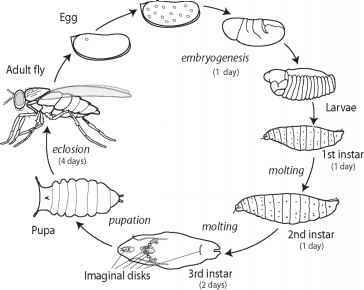 Basic stages in insect development; Drosophila, from fertilized egg to embryogenesis, larval stages, pupation and eclosion, or metamorphosis, to adult fly. In the important transition from the syncytium to the cellular embryo, the nuclei in the former locate around the periphery of the egg, and membranes form to separate them into separate cells. The embryo forms stripes of gene expression (not shown) that are precursors of the axial segmentation that is important from the early embryo stage through to the highly segmented adult. 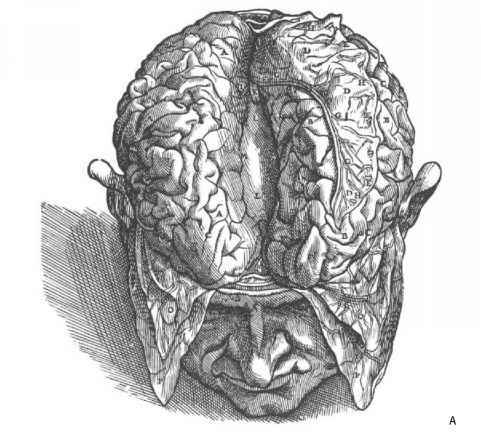 system, with the brain at one end and differentiated branching along the AP axis, referred to as an "inverted" body plan. The vertebrate circulatory, gut, and nervous systems, however, develop with more complex turning and folding, by differential growth at various places along the axis, versus the corresponding system in arthropods, which is more or less straight along its major axis. In both groups, local signaling centers or organizers guide the development of structures like the distal tips of developing limbs and the midbrain and hind brain regions of the central nervous system, teeth and feathers, and the like. The neural axis is dorsal in chordates but ventral in arthropods, and the digestive systems have reverse relative locations. There is healthy debate about what homologies if any might be involved, as will be discussed in Chapter 9.